It’s been an awkward condition in the host I’ve been setting. It is that the application windows live mail unable to run properly in non administrative user. for example, I can’t delete or add contact in user level, but I can do it in administrator level. There are ways using windows application, but it is not save, since it is still need to insert the password, that it is becomes visible because it is in command prompt. What I’m talking is for windows 2003/xp below, that using runas command to run application using different credential than what currently logging in user. 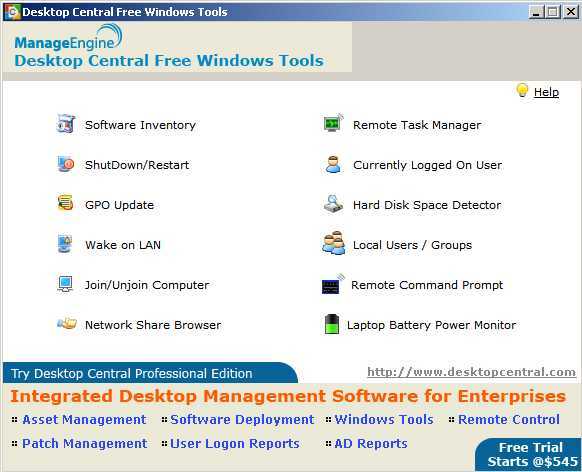 if you are an IT administrator in your comuter and want to know what happened in your LAN computers without go to that computer, this is the answer: desktop central free windows tools. it is a software to do administrative task on remote computer. there two version of the software the webbased one and like the picture above as a windows application. i mostly use remote task manager to stop the unnecessary task/service remotely.